TEG will be attending this year’s MA Exhibition in Belfast, 8th-9th October 2018. You can find us in the Networks Hub, in the MA Exhibition, with other sector organisations. Please come and say hello to us if you’re an existing TEG member, we always like to meet our members, and if you’re not already a member but would like to find out more about TEG, do come and speak to one of the TEG Committee or staff on the stand. 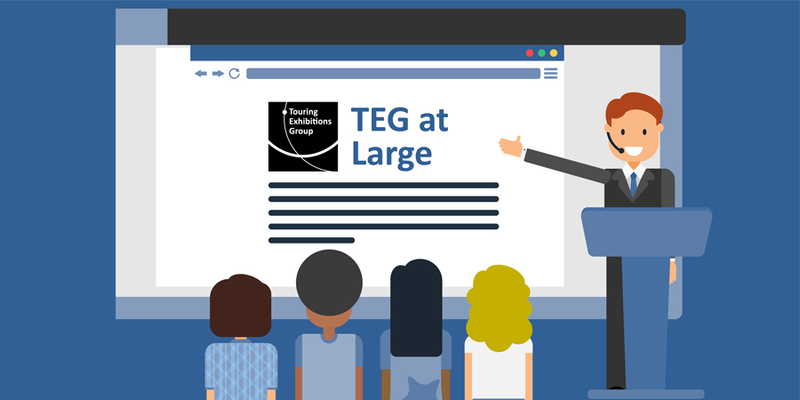 We will be pleased to tell you about the benefits of TEG membership, the resources we make available to the sector and our training, professional development and consultancy opportunities. TEG’s Professional Development Manager, Charlotte Dew, will be presenting ‘A proposal for removing barriers to lending and borrowing’, based on the organisation’s work with Arts Council England (ACE), the National Museums Director’s Council (NMDC) and Art Fund on the Preparing to Borrow programme, since April 2017, at the ERC 18, on 18th November 2018. The paper, part of the Refresh conference stream, will propose a framework for removing barriers to lending and borrowing faced most especially, but not exclusively, by those looking to lend or borrow for the first time. Using the findings from TEG’s ‘Lending and Borrowing Experiences Report’ (Dew:2017) as a starting point, it will outline the barriers, and how through a framework of training, mentoring and small procedural changes these may be removed, resulting in fruitful partnerships, benefiting participating institutions, as well as the public through the resulting exhibitions. It will argue that change of this nature is only possible when organisations are open to collaboration; that borrowing activity should be considered a partnership, not a transactional activity. We launched the TEG Lending and Borrowing Experiences Report on Thursday 16th November. Thank you to everyone who joined us in Manchester. TEG presented details of exhibitions available to tour internationally at the MUSCON Conference 2017 in Helsinki, from the 20-23 September 2017, on behalf of TEG members Art Works for Change, House of Illustration and People Dancing. Borrowing and lending between museums of different scales and types is an important two-way opportunity to share objects and expertise, and increase opportunities for public engagement. This session will present the results of the Touring Exhibition Group’s (TEG) ACE-funded research into borrowing practices, together with case studies and recommendations for good practice as a lender and borrower. It will also introduce the TEG and National Museum Directors Council’s Preparing to Borrow programme of training, mentoring and match-making. Muscon is a working platform focused on co-producing and travelling exhibitions. TEG attended the 2016 event in Vienna to promote a range of TEG members? exhibitions, available to tour internationally. See our MUSCON 2016 leaflet. In May 2016 TEG Researcher Charlotte Dew, attended this annual meeting in Washington DC, with support from ICOM UK. In her subsequent report she reflects on the similarities and differences between the UK and USA domestic touring markets and what UK organisations can learn from the approach taken in the UK. Download TEG USA report.